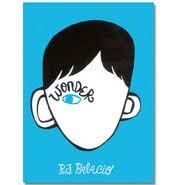 Let Children's Craniofacial Association help you bring R.J. Palacio's "Wonder" into your school's curriculum this year by reading the book, using CCA's cool program packs, and inquiring about having a "Real Life Auggie" visit your school. Would your child like to be one of our CCA WonderKids? We are contacted by more and more Elementary and Middle schools who want to be connected with a "Real-Life Auggie," who is the main character from the book, "Wonder." This is one of the elements of CCA's Choose Kind program. Parents, let your schools know all that we have to offer to support them in teaching the message of kindness from this significant book to our community. 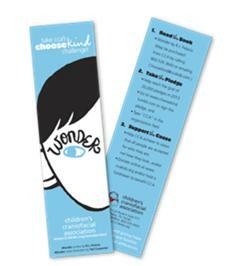 We have everything from bookmarks to the ChooseKind pledge that your students can take at the beginning of the school year. Cards and words of encouragement written by a class after they read "Wonder." The student response in the schools that have run our programs and curriculum packs has been impressive. Other project ideas that CCA offers students are a penpal program, Skype sessions, and visits by the aforementioned "Real Life Auggies", our CCA Kindness ambassadors. Your students could be writing letters, sending cards to the Wonder Kid we assign you. Many receive standing ovations at the assemblies they are part of when they visit the schools. Learn more about all that we have to offer at our "Wonder 4 Schools" webpage. If your child would like to volunteer to visit a school or if you are interested in CCA's curriculum packs, contact Annie Reeves, areeves@ccakids.com. Your child must be between the ages of 9-18 to participate. Also, check out Random House and Lionsgate curriculum collaboration and make your classroom a Certified Choose Kind classroom. All of these cool ideas will help you teach this important book to your children. Hopefully, it will change the way they see and treat others this school year and in the ones to come!